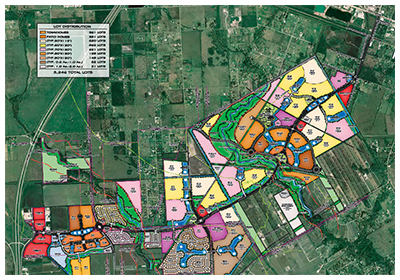 GC Engineering, Inc. (GCE) prepared a Master Utility Plan for the water and sanitary sewer services for this rapidly growing area south of Houston. Preliminary design of the sanitary sewer system included two Wastewater Treatment Plants (WWTP) with 1 Million Gallons per Day (MGD) and 0.6MGD capacity. The system also included approximately 8 miles of gravity trunk sewers and six sanitary sewer lift stations. GCE designed an efficient and economical wastewater collection system by optimizing the combination of gravity sewer and sewer lift stations as well as by strategically locating the WTTPs to serve the future development of the area. Under Phase I of the work, GCE prepared final designs and bid documents for construction of approximately 6,000 feet of trunk sewer lines, one sanitary sewer lift station with 3 pumps, each 190 gpm capacity, and Phase 1 of the WWTP#1 with a capacity of 160,000 gallons per day capacity. WWTP#1 has an ultimate capacity of 0.6 MGD. The initial phase of the plant consisted of two aerators, 2 digesters, a clarifier, and a chlorination system. The system was designed to meet state standards for effluent quality of 3 mg/l ammonia-nitrogen, 10 mg/l BODs, 15 mg/l TSS.